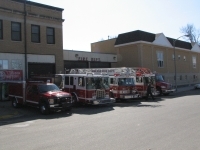 The Abilene Fire Department is responsible for ensuring fire and life safety and to reduce the risk of fire loss to the lives and property of the citizens of Abilene and Dickinson County. If you plan to burn, notify the fire dispatcher at 785-263-1121. Open burning shall not take place when wind velocity exceeds 15 mph. For more details, view burn permit requirements. The City Commission approved Ordinance No. 18-3365 which allows retail sale and discharge of fireworks within the City of Abilene. Are burn permits required in the City of Abilene? What is your average department response time? Does the Fire Department go on EMS calls?